Here’s how to build and setup an animated coffin that opens and closes using pneumatics! This project is great for Halloween but can be used for other occasions like birthdays, parties, etc. This setup is about the simplest way you can make it and still retain quality. This setup is very easy to do (can be done in one day with the necessary parts) and cheep I believe it cost me about $50-60 to go from start to finish. To trigger it I used a 3/4″ sprinkler solenoid valve and a home wired motion detector (see bottom of page to find a link to instructions for that). The other nice feature is that it doesn’t require a lot of CFM’s so even small compressors are able to run it. You will also need some screws or nails I used a box of 1 3/4″ screws. 2 Pine boards 22″ long with a 15 degree angle on one side and a 45 degree angle on the other. 2 pine boards 52″ long with a 15 degree angle on one side and a 45 degree angle on the other. 1 pine board 17″ long with two 45 degree angles. 1 pine board 14″ long with two 45 degree angles. Now you can begin assembling the coffin by using those 1 3/4″ screws or whatever you bought to put it all together. 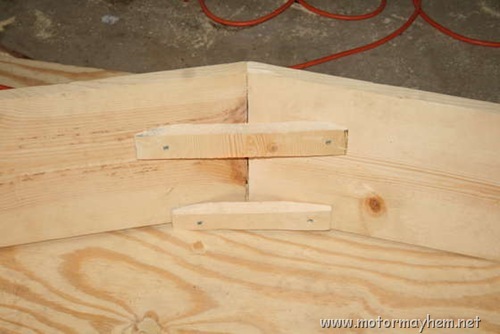 The way I did this was by screwing the screw into the pine just a little and then turning it almost parallel to the wood so that it goes through the angle you cut and into the other piece of wood. I also added some supports to the place where the 15 degree angles meet. For the base and top I just traced my frame using a sharpie onto the plywood and cut it out with a jig saw. This assured a perfect fit (if I was perfect at cutting). Now it’s time to screw the base to the frame using that box of screws again. Then using the 3″ hinges you bought you can put the top on. 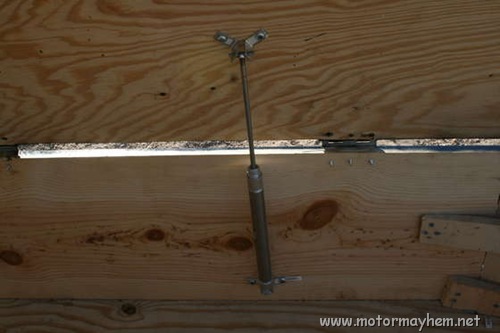 Make sure you only put hinges on the part below the 15°joint or it will not open. Now it is time time to add the pneumatic cylinder to make it open. First you need to widen the holes on the L bracket if they don’t fit over the pivot mounts already. Then you need to flatten the “wings” on the wing bolt so they will stick out straight. To do this is used a vice. 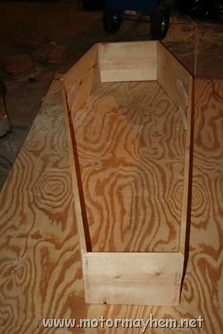 Then you need to get in the coffin and mark where the brackets need to be so the coffin will open all the way. Then you can screw in the L brackets so that the bottom of the cylinder in mounted. 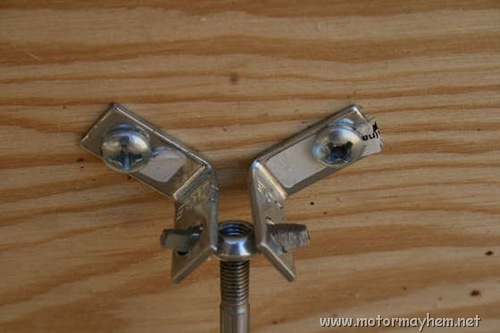 Then do the same for the top using the wing bolt like the pivot mount on the bottom. Mark it with the coffin closed and open it all the way keeping the holes over their marks and see if it is open enough for what you want, then screw it in. Now you can paint it and hook up the air to it. I also added a strobe light and fog machine for effect. To activate it I made a pressure activated switch and buried it under the dirt path past the coffin so when people unsuspectingly walked by they would trip it and get a little Halloween surprise. 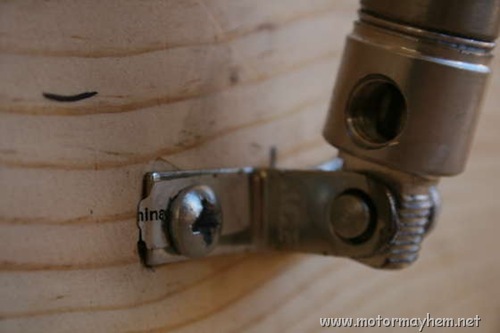 Instructions on how to make a motion activated switch for a solenoid valve. 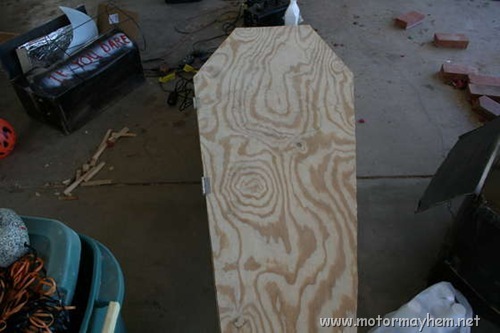 I would like to do a coffin similar to yours and try a skeletal movement using PVC frame. I would probably use two regulators for two air lines. Ya that would be cool. I used some thin wire between the skeleton and the inside of the coffin lid on mine to make a skeleton sit up when the door opened. Im getting into pneumatics. I want to do one or two pneumatic props in my haunt. Would a 3 gallon air compressor be sufficient and should it be gas or electric? What do you recommend, thanks for your time. It really depends on what pneumatic props you are planning on making/using and how often you want to trigger them. The coffin here could be run on a 3 gal compressor without much difficulty if it was being activated maybe once every 3 minutes or more. What types of props were you thinking of using and how often? When sizing a compressor look at the CFM rating. That number is how much air it can compress per minute. Also the duty cycle is important because that is how long it can run in a 10 min peroid before it needs to stop and cool down. 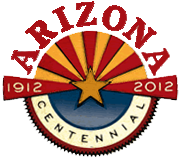 For example, a 20% duty cycle means it can run for 2 min before needing to cool for 8 min. As for gas or electric either will work fine if sized correctly, its more a matter of having or not having electrical power where you locate the compressor. Remember they are pretty loud when charging up so I would reccomend buying a lot of hose and locating the compressor behind your house or somewhere else where it wont be annoying. What kind of air compressor is needed does it have to be self recharging? I used a self recharging compressor. You could use a non self- recharging one, but it would only work for a limited time. The size compressor you need would depend on how often you want to open and close the coffin, but a small compressor should work pretty well. The only mechanism it uses is the pneumatic cylinder you buy. To automated it I used this device so it would activate from a motion sensor. What solenoid did you use for this. Do you have a parts list i can have so that way i cane order from the website you provided and possibly find these items at home depot or lowes. That one looks like it should work. You will need to get adapters unless you can find one for a smaller pipe. You also need to open the top and stretch the spring in there or lower the pressure from your compressor or the valve will not have enough power to close. I hope you’re still replying to questions. I’m new to the ways of the pneumatic cylinder. For my coffin, I’ve hooked the cylinder you suggested up to my air compressor with a ball valve to control the flow of air. The cylinder opens great but closes only because I have a small leak in my air hose. I can replace the hose, no problem, but then the cylinder doesn’t close at all. How did you get your coffin lid to close so nicely? I’m guessing it is because of the sprinkler solenoid but I know nothing about those. I hope you can help. Thanks in advance. I used a hard steel line in the inside of the coffin and simply drilled a small hole in the line to bleed pressure off when the supply was cutoff, but not big enough to prevent it from opening. If you want it to close faster just add another hole. I found this to be the cheapest option. 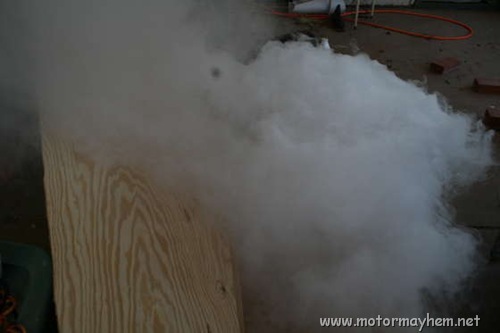 It also makes the smoke from the fog machine swirl around and adds to the effect. I am not 100% sure but some sprinkler valves will have a one way valve in them that could probably vent the pressure when it closed but I have not use that myself. That makes sense. Thank you for your reply! How did you make the pressure trigger? can you give instructions on how to do that by any chance? I have been trying to figure this out for a prop I am building.. Here is a better motion activated design.